NEW VERSION. 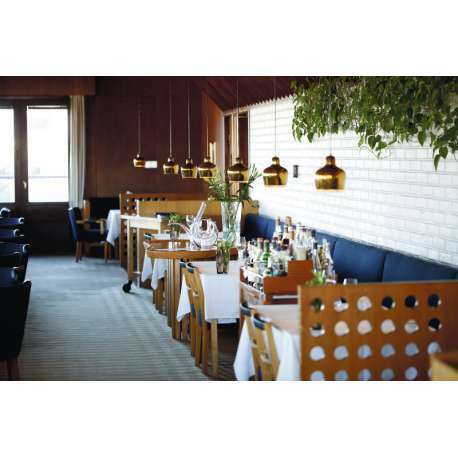 In 1936 Aino and Alvar Aalto originally designed the world-famous pendant lamp for the Savoy restaurant in Helsinki. The lamp is also known as ‘the Golden Bell’. In 1937 it was exhibited at the Finnish Pavilion of the Paris World Expo. This elegant ceiling lamp is made of a single piece of brass and has a black textile cord. In addition to the classic model, which the inside is painted white, this new version is painted gold. 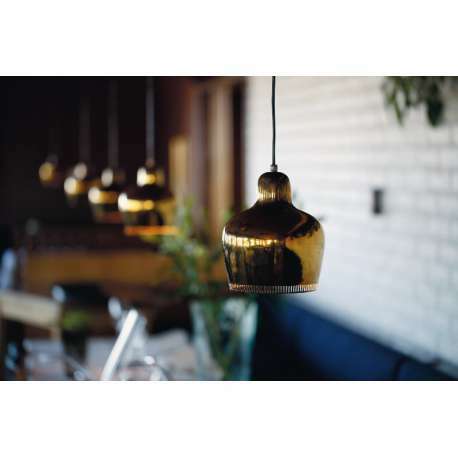 The golden bell produces a golden warm-toned light. Thanks to the natural oxidation process, you will get a gorgeous patina over time. This beautiful lamp gives your interior an instant vintage look.